2. Remove air cleaner box, Mass Air Flow meter (MAF) and air intake tube. 3. Remove throttle cable and throttle linkage bracket. 4. Disconnect the engine harness from the Idle Air Control valve, Throttle Position Sensor and EGR valve. Alsodisconnect the EGR vacuum line and breather vent tube from throttle body. 5. Remove the throttle body and EGR plate. 6. Remove the throttle body and EGR studs (to be re-used in installation step 11 below). If the system will be usedwith an EGR eliminator, purchase #720-59 1.375” studs (sold separately). 7. Remove the EFI cover (if equipped). 8. Remove the intake manifold and vacuum lines. It is the sole responsibility of the installer/user to insure that all linkage(s) operates freely andwithout binding or sticking. Serious damage to property or personal injury could occur as a result. a. Install supplied o-ring in groove in top of intake. b. Install intake lid using the 12 supplied flat head screws. Tighten from the center out. 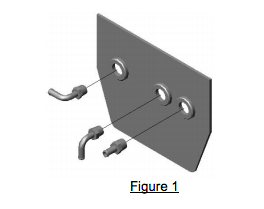 c. Install the 3 supplied 1/8” NPT fittings in rear of intake (see Figure 1 below). From left to right (whenviewing from the back of the intake) install the two 90 degree fittings first. The left fitting should point tothe left. The center fitting should point down. The straight fitting should be installed on the far right. 2. Clean existing intake surface of any residual gasket material. 3. Install the 6 supplied studs into the existing manifold base with a dab of blue (medium) threadlocker and handtighten. 4. Loosen the passenger side fuel rail. 5. Install the supplied intake plenum gasket over the studs. 6. With the intake level to all the studs, install the Max Box on the lower intake. 7. Tighten intake down from the center out using supplied ½” washers and nuts. 8. Install vacuum lines. The use of a vacuum tee maybe needed. 9. Tighten the passenger side fuel rail which was loosened in step 5. 10. Install the throttle body & EGR studs with a dab of blue (medium) threadlocker and hand tighten. 11. Reinstall EGR plate, throttle body, hoses and electrical connections using supplied gaskets.Reinstall throttle linkage bracket and throttle cable. Be sure throttle linkage has full travel and that alllinkage(s) operates freely and without binding or sticking before proceeding. Serious damage to propertyor personal injury could occur as a result. 12. Reinstall intake tube, Mass Air Flow meter and air cleaner box. 14. Start engine and check for any vacuum leaks or loose connections.